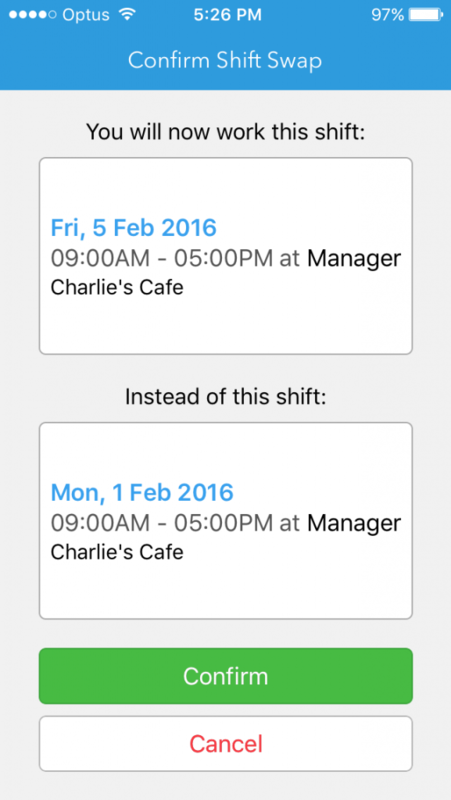 This feature allows employees to see other shifts and request a swap. To enable shift swap in a location, you must be either a Location Manager or System Administrator. 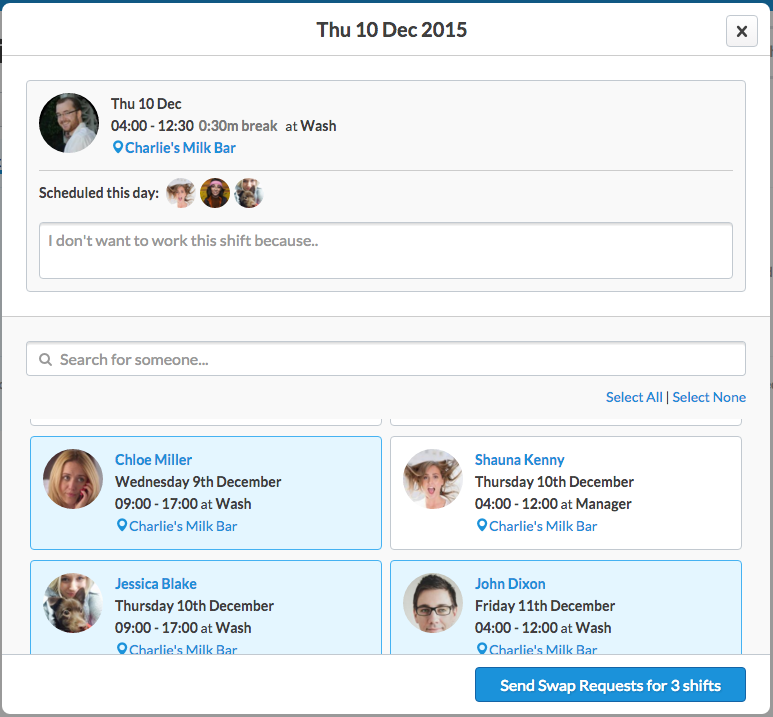 Shift Swap allows an employee to request one or more of their suitably qualified colleagues work one of their shifts and, in exchange, work one of their colleague's future scheduled shifts. Depending on your preference you can require that a manager approve the swap, or you can allow swaps to go through automatically, which makes this a great way to reduce your administrative burden. Given that Shift Swap and Offer rely on employees being able to see each others' shifts, it can only be enabled if employees are permitted to view others’ schedules. 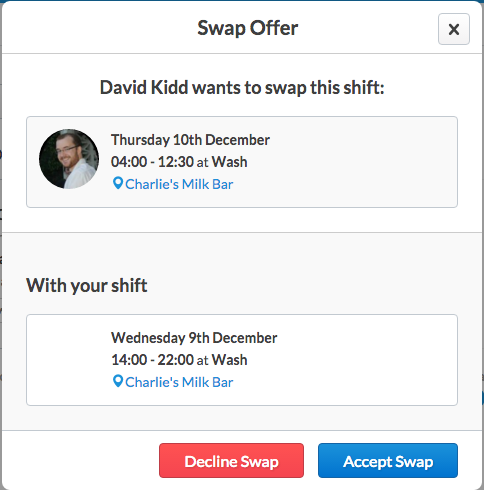 Enabling and using shift swap/offer is currently available on our web app, as well as our mobile applications (iOS and Android). How Do I Enable Shift Swap? First, log in and go to your Locations page. Once you're there, click the Edit Settings button next to the location. On the resulting page, click "Scheduling" on the left to access your Scheduling settings. Please scroll down the list of options and toggle the top option below. There are separate toggles for the Swap and Offer functions. Simply toggle on the options you'd like to use. If you'd like to require approval of shift swaps, please turn on the relevant option. 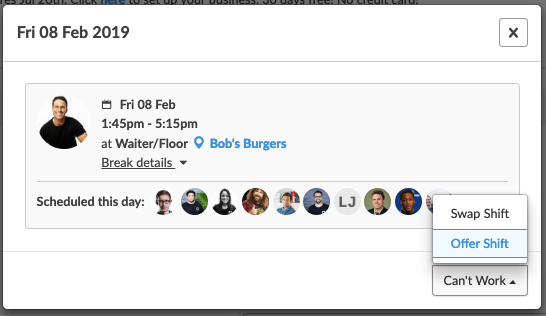 Note: "Allow employees to view each others' schedules" must be set to "Allow All" as shown. That's it! 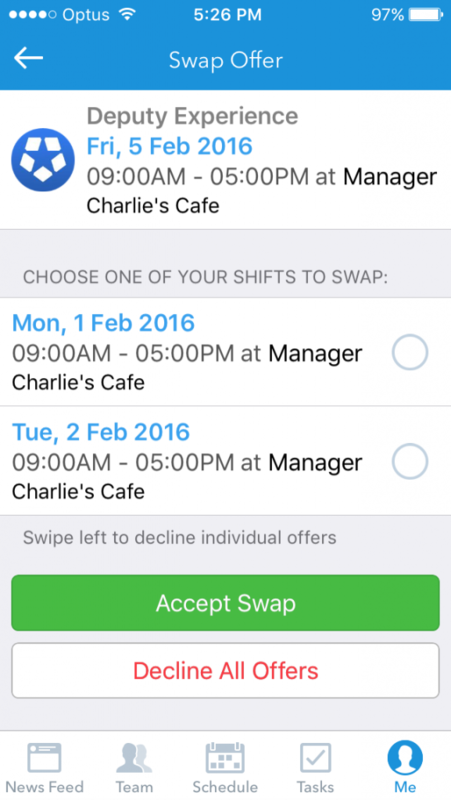 Your employees can now swap and offer shifts. If you have required approval for swaps, you will be able to do so on the schedule. When Scheduling, you'll see swaps awaiting approval coloured light green. To approve or decline the swap, click one of the light green shifts. This will display the shift swap, as well as any savings or additional costs caused by the swap. Click the relevant option to finalise the swap. How Do Employees Swap Or Offer A Shift? If the permission has been enabled for the workplace, shifts can be swapped, offered, and claimed from the Me tab. To swap or offered a shift, first click the shift. This will bring up the shift details. You'll see "Can't Work" in the lower right corner. Clicking it will display the option to swap or offer the selected shift as explained above. Click the relevant option to proceed. The example we will use is a shift being swapped. If this is selected, the employee will see a list of other employees that the selected shift can be traded for (shown below). To select the shifts, click them, then click "Send Swap Requests for X Shifts". It isn't possible for an employee to trade one of their shifts for multiple of another employee's. If you're being offered a shift, you'll receive a notification on your phone if you've downloaded the app. Otherwise, you'll receive the offer by email. If the selected shift is being offered, the employee will instead see a list of available employees. The employee then selects the employees to offer the shift to, then click "Invite X to work this shift". That's it! Please note, until the shift is claimed by another employee (and possibly approved by a manager) the shift is still your responsibility. If the permission has been enabled for the workplace, shifts can be swapped and offered from the Upcoming Shifts section of the Me tab. After navigating to the Upcoming Shifts section, tap the shift you'd like to swap or offer to bring up the Shift Details, as shown below. To offer or swap the shift, tap "Can't Work". 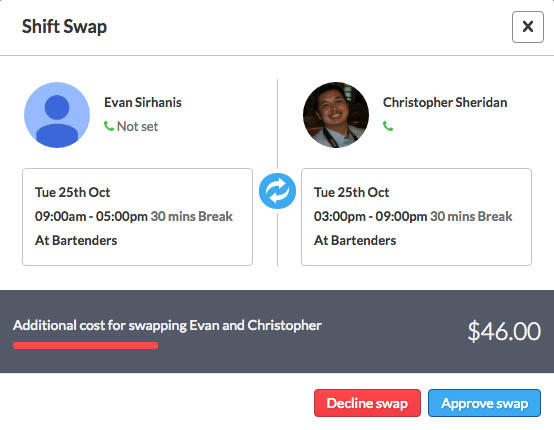 You'll see the option to offer or swap appear. You may see one, both, or none of the options, depending on which settings your managers have enabled. Tap the relevant option. If you are offering the shift, please select which colleagues you'd like to offer the shift to. If you are swapping the shift, please select which shifts you would like to swap yours for. The other employee will be able to decide which shift to trade it for. The following is the result of 'Offering' a shift. This gives the shift away with no shift in return for the sender. Meanwhile, the next picture shows the results of tapping 'Swap Shift'. This allows the user to see eligible shifts that they can swap with. Finally, click "Send" in the top right corner to send the offer/swap request. How Do Employees Claim Shift Offers? Employees claim shifts from the Me tab. They will see available offers for their current week below, and can also click "Available Shifts" to see a list of offers. Shifts that were Offered will appear as Open shifts, which can be claimed by clicking them. To accept a swap request, click the shift to display the details. 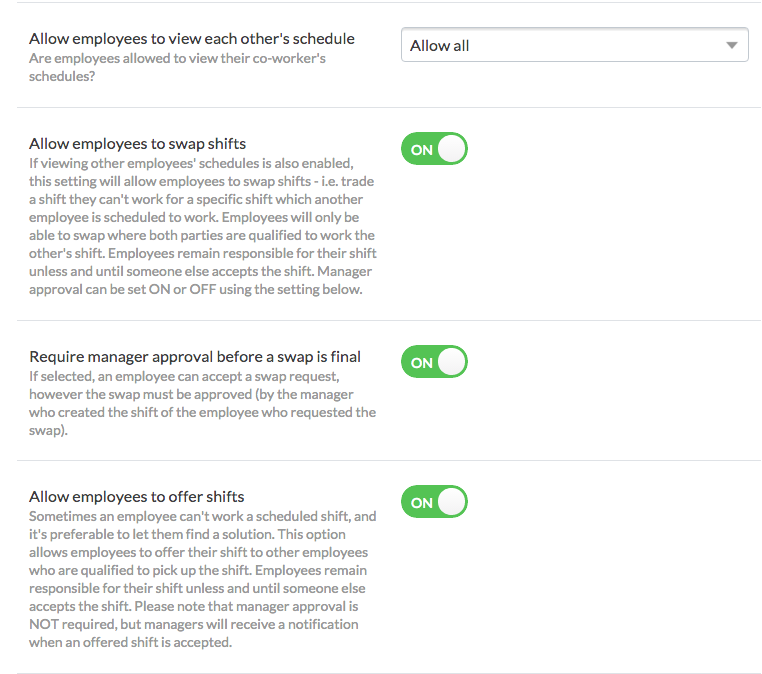 If the employee has offered the shift for more than one of your shifts, you can select which one you'd like to trade for the offered shift by clicking it. After doing so, click "Accept Swap". If the workplace is set for swaps to be approved automatically, the original shift will be traded for the accepted shift. Otherwise, a manager will need to approve the swap as explained above. Employees will be sent a notification whether the manager approves or decline the swap. Until they receive a notification, employees should assume they're working their currently scheduled shift. To claim an offered shift or a shift swap, first go to the Me tab, then tap "Available Shifts". This will only be visible if you have the latest version of the app downloaded. To claim an Open/Offered shift, tap the shift to go into the details. You will see a Claim Shift button. Tap it to claim the shift. To accept a swap offer, tap the available shift under the swap section. 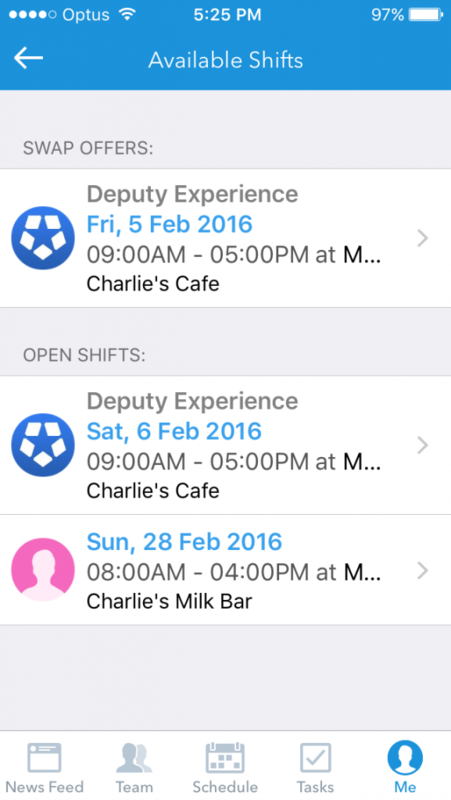 On the next screen, tap which of your shifts (if any) you would like to swap with this particular shift. After selecting the shift you'd like to swap (it will appear with a tick) tap "Accept Swap". On the resulting page, click Confirm to finalise the swap. Depending on your manager's settings, they may need to approve the swap for you. If this is the case you will be notified. How Do I Accept Shift Swaps? Alternatively, you can view a shift swap request via the Schedule page.